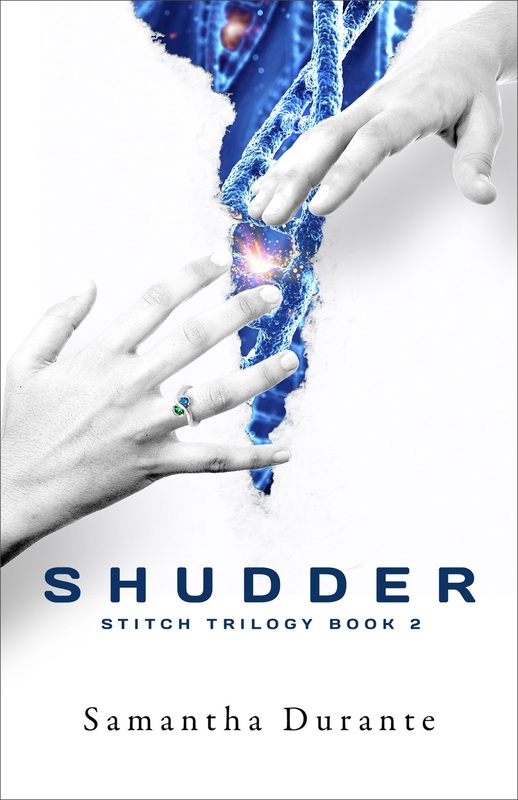 Recommended to: Readers who fell in love with the first in the series, Stitch. 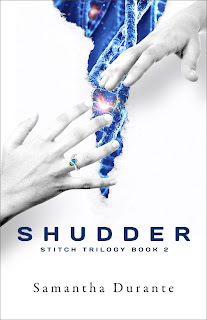 I reviewed the first book in this trilogy, Stitch, last year and was fairly impressed with it. Samantha Durante brings something fresh, and new to the table in her series. I knew I'd be back for more. That being said, I'll share that Shudder blew its predecessor out of the water! This book had everything I loved from the before, and everything I was missing as well. Kudos Ms. Durante, you hooked me from page one. Shudder picks up right where we last saw Alessa, as her and Isaac flee Paragon. There is a nice portion of backstory laid into the first few chapters, so you won't be lost. Despite having escaped, Alessa and Isaac soon find that there are worse things than Paragon. Drastic weather conditions, strange creatures, and the fear of disease cause them to constantly be on edge. Not to mention the fact that odd things are happening inside Alessa's head. Things she can't quit explain. Where the first book started a little slowly, this one takes off like lightning and maintains a great pace the entire way through. New characters are introduced this time around. Nikhil and Pheonix really added some spark to story, and I enjoyed getting to see events from their points of view. Although I'm not usually a fan of multiple points of view in a book, Samantha Durante handled it expertly. There were only two times I had to go back and see whose point of view I was reading from. What made it worth it was that I was able to get to know each character so much more in depth. I bonded with Alessa this time, and it made for a much more enjoyable read. The only qualm I had, and it is a small one, is that some of the necessary information was squished into awkward dialogue. There is one scene in particular, where Alessa and Isaac discuss the disease, that felt a little stilted to me. I completely understood that the information was necessary to make the story flow. I just wished it would have been more evenly distributed throughout the book. It wasn't anything that made me stop reading, just something I noticed. So again I state, kudos to Samantha Durante! Shudder was a brilliant followup to Stitch and I truly can't wait to see what comes next! With the improvement I saw between the first two books, I can only assume that the next installment is going to blow my mind. I'll be here, and I'll be ready. Nomad Book Blitz + Giveaway! Blogger Backstage Pass: Natalie from Books, Etc! Wilde Nights Spotlight and Giveaway!